This entry was posted in Training & education on 2018/03/14 by Susan. Storing even a small amount of flammable material in a shipping container can lead to an explosion. Adequate ventilation is crucial for safety. Shipping containers have long been used for transporting goods across the ocean – they’re secure, mobile, and watertight. These features are also why more people outside the shipping industry are using them for storage, as offices, and even as living spaces. But using containers for other purposes without the proper modifications poses safety risks. It can be especially dangerous if you store flammable products in them without sufficient ventilation. Even a small amount of flammable substance – as little as one litre – can vaporize in a shipping container and explode if combined with a spark or heat source. That bit of fuel in a lawn mower or barbecue propane tank could be enough. Sadly, there have been quite a few incidents of this type already. In one tragic situation, gasoline-powered chainsaws inside a container caused an explosion that blew off one of the container’s 250-pound doors, which struck and killed a firefighter. “You see shipping containers at schools, hospitals, and all over the place, yet there’s often no signage about what’s inside. Is there a table and chairs inside or a bunch of landscaping equipment with gasoline?” asks Jenny Colman, a human factors specialist at WorkSafeBC. “People need to understand what ventilation they’re required to install if they do store flammables or combustibles in shipping containers,” says Jenny, adding that some are hesitant to make modifications because they don’t want to affect the security of the containers. But having adequate ventilation is crucial for safety. 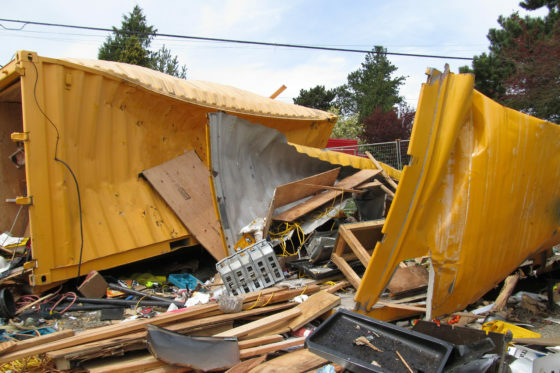 According to Preventing explosions in shipping containers used outside the shipping industry, a WorkSafeBC safety bulletin, installing ventilation in a container allows vapours to dissipate and reduces the risk of explosion. In this article in The Ashcroft-Cache Creek Journal, the chief of Ashcroft’s Volunteer Fire Department reminds owners that shipping containers with flammable or combustible products inside should also be kept away from other buildings and fuel sources. He recently saw a container with propane and fuel tanks inside, and a stack of wood beside it. Do you know how else shipping containers are being used? If so, please share in the Comments box below.